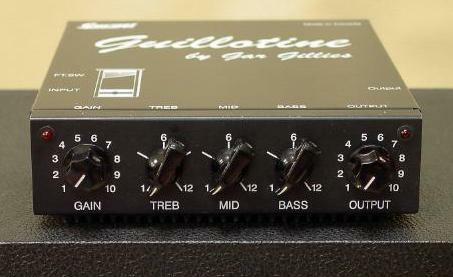 The samples below were produced using a stock Fender Strat into a Guillotine output to a Peavey Classic 30 1x12 combo. They were recorded with an AKG condensor mic onto a Studer/Revox 8 track tape machine and then transferred to a Phillips direct CD recorder. No other effects or noise reduction devices were used. These samples only scratch the surface of the complete range of sounds available with the powerful controls on the Guillotine. Special thanks to Randy Jamz for providing the great chops.